I often wonder what is going through my daughter’s brain. I remember watching her when she was two years old, wandering around the house naked. (OK, she was wearing a bib tied around her waist and white socks.) carrying a softball and a backscratcher. She dressed the softball in a necklace, “scratched” all the “dirt” off it “to make it clean” and then wrapped the backscratcher in a piece of cloth to “keep it safe”. This process took about 20 minutes and as I watched, I thought: The imagination and creativity in a toddler’s mind is amazing. While creative play may seem to be just that – play – it is so much more. By participating in creative activities, every child is learning and developing. In other words, it’s time to play. And parents need to be involved in the process. This doesn’t mean you have to set up elaborate creative work stations in your home (although, those are kind of cool), it means involving kids in your own everyday creative experiences (like baking, cooking or gardening) and encouraging their own activities. 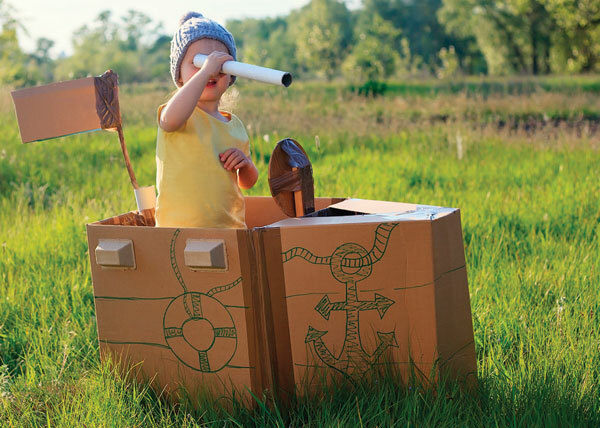 Provide the materials for creativity – art supplies, dressup clothes, blocks, instruments or even old cardboard boxes – and let them do the rest. You know that “garbage” in your house, like toilet paper rolls, yogurt containers, cardboard boxes and plastic juice bottles? To a child, these are robot pieces, forts and instruments. Keep them, clean them and hand them over. Old purses, wallets, shoes and clothes are the wardrobe for playing house or putting on plays. Hang on to discarded items for when the creative mood strikes. Have a dance party. That means you dance, too. Make up silly moves and copy one another. Kick things up a notch by singing or playing your own music. Experiment with colour. Water, snow or shaving cream plus a little food colouring is a recipe for creative fun. How a creativity course jump-started one mom’s inspiration.